CANFIELD, Ohio – Members of 7 17 Credit Union who live or work in Canfield will soon be able to visit a branch much closer, instead of traveling to either the Boardman or Austintown branches. 7 17 held a groundbreaking Tuesday for its 13th branch at 4280 Boardman-Canfield Road. The branch is expected to open in early spring of 2019. “This is probably going to be one of our best locations just because we already have so many members that are already in such close proximity and this is a vibrant growing community,” said Bill Fulk, senior vice president of lending for 7 17. Fulk was joined by other 7 17 employees, board members, and community leaders to celebrate the start of construction on the new branch. The cost of the project is around $2.5 million, said Eric Lanham, senior vice president of marketing for 7 17. When completed, the branch will be around 4,200 square-feet, and will be a full-service branch, including lending and wealth management services, ATM access, and lobby and drive-thru services with updated technology. 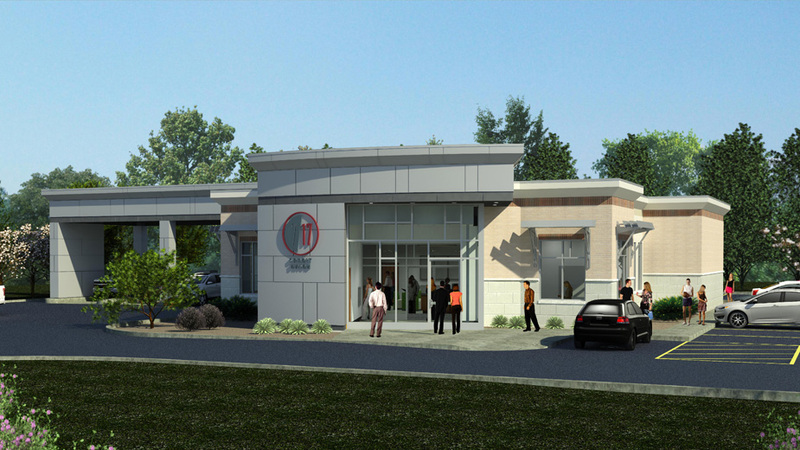 Pictured: Rendering of the Canfield Branch. “We’ll see a newer technology in the drive-thru, a little less-traditional environment in the branch, but we’ll still be able to do the same types of transactions,” said Mark Munno, senior vice president of delivery channels for 7 17. The drive-thru will have an interactive teller machine that looks similar to an ATM, but will allow members to interact through video technology with a teller who is in a remote location. The updated drive-thru technology will also be implemented at 7 17’s new Larchmont Branch in Warren, which construction on the branch is expected to begin in the next couple of weeks. Tellers will be inside the Canfield branch to help members in an updated teller-station pod environment. 7 17 has partnered with architects from Baker, Bednar, Snyder and Associates and contractor Jack Gibson Construction of Warren for the project. The credit union has more than 79,000 members and anyone who lives, works, worships, or attends school in Trumbull, Mahoning, Columbiana, Portage, Summit, or Stark counties is eligible to become a member. Pictured: Randall Baker, director of business development for Baker, Bednar, Snyder and Associates; Brian Governor, Canfield Township Trustee; David Ditzler, Mahoning County Commissioner; Joe Paloski, Canfield Township Trustee; Christine Oliver, Canfield city councilwoman; Canfield Mayor Richard Duffett; Maria Izzo Cartwright, Canfield Township Trustee; Gary Soukenik, president and CEO of 7 17; and Jack Wilster, 7 17 board chairman.